Would you join me in learning about making a blog posting schedule on Steem during day 4 of our basic training here because this can be extremely helpful in guiding our creativity in a measured and consistent way? Let's take an analogy for running a race. Let's picture we're at a track somewhere and we walk up to the track, we know we need to run around the track, but how many times do we need to go around? If we just need to run once around the track, we could afford to sprint. Some of us could afford to sprint almost the entire time around the track because we know we just need to make one lap around and we can afford to be exhausted after one lap. If we need to run four laps, we might want to make a little bit slower pace so that we can make it all four laps without burning out. If we walk up and someone tells us that we need to run 200, or get around the track 200 times, then we definitely do not want to start off sprinting. In fact, we might want to just walk around the track 200 times because over a period of maybe 10 or 16 hours we could probably comfortably walk around the track 200 times at a nice steady pace. However, if we tried to sprint or run around the track 200 times, especially fields that are a quarter mile long or about 400 meters, we would find ourselves unable to get through the entire race. 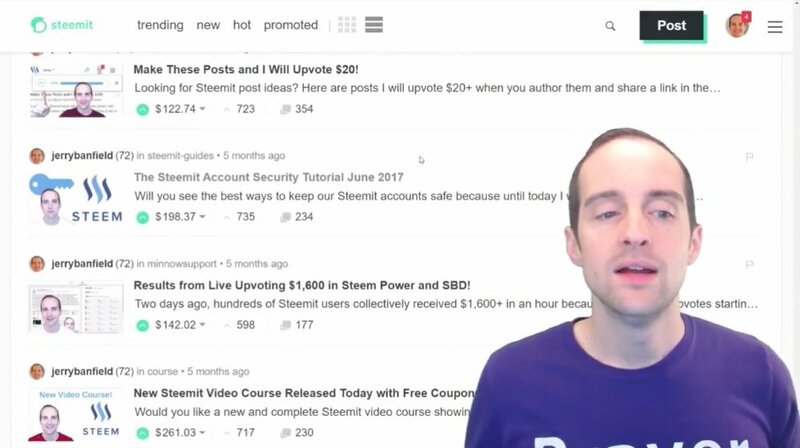 With Steem that is a very important consideration in terms of, how often are we going to post? 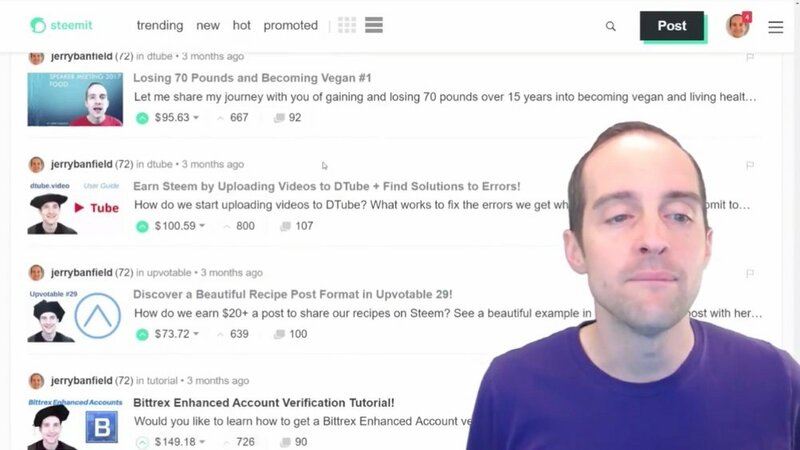 Based on six months of experience testing different posting frequencies with as little as one post a week, with as much as three posts a day, I personally think that once a day is the ideal posting strategy. Most of us are, "What have you done for me lately?" kind of people. In the event that we get a reader who's really excited about what we have to say, we want to have something available as often as possible. We want to have posts that are available on a daily basis. But the problem is, if we do more than one post a day, it gets to be too much. It gets to turn into a sprint where all of a sudden the day comes along and we just can't keep up with it. I was testing out two and three posts a day because this was doing great for my income. Doing two posts a day making $100 or $200 a post was extremely gratifying, but the problem is doing two posts a day is just like trying to sprint around the track. You can burn out, and then often we end up paying less attention to the quality of each individual post, which makes way for posts that screw things up, that can often cost us a lot of our readers, that can cost us a significant amount of our income. When we're posting too often, we risk burning out, and when we don't post often enough, we risk losing our attention. One post a day I think is ideal for a long-term marathon strategy on Steem. If we want to earn the most money on our posts, if we want to bring the most readers, if we want to have a chance at doing Steem full time or at least part-time as a hobby, I think it is ideal to do one post every single day. The best results I've had have been doing one single post a day. When I was doing one post a day, I was getting as much as $1,000 on some of my posts because all of the energy on my posts was focused on that one post a day. The problem is when things go well we are tempted to do more. When I was getting a ton of money on my posts a few months ago, $200, $300, $500, and sometimes $1,000 on one post, that's when I started testing doing more than one post a day, and from there the income dropped significantly because more than one post a day as a reader is way too much. Sometimes more than one post a week as a reader is too much. One post a day is ideal in terms of getting discovered, that gives us the chance every day to put a post into Google that has a chance to rank in search results, that has a chance to get shared on social media. I think then, when we start from the beginning with a posting strategy that we think we can do indefinitely, then we have a comfortable boundary set. It's easy to burn out that way. If I do less than one post a day the problem is, I start to miss opportunities to reach readers who are willing to read one post a day and I start to go all-in on posts. Recently I did this one post, it's the only post I did all week, and then the problem is I got too much into that post. I've invested too much into that one post. 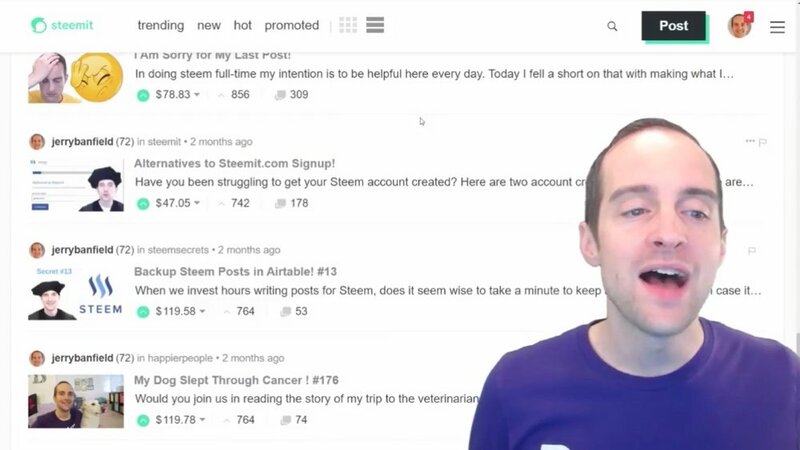 If it doesn't do well, if the topic’s poor, if it's not good for organic search traffic, then the problem is it's easy to get resentful and say, "Well, forget Steem. I did that post last week and no one voted it. I put my whole week of effort into it and I'm just going to give up." When we do a post every day, we can let go to some degree. We can say, "Look. I'm going to do a post today and that's my job. My job is to do one post every single day." I do the post every day and I leave it up to the readers, the upvoters, to decide what to do with that post each day. This provides a nice peaceful way to create. I just do a post every single day, and then whatever happens, happens with it. That's comfortable for me and today I don't even look at the upvotes on my posts anymore. On the new posts that I'm making, I don't even look at the upvotes because I'm doing a post every day, that's my job, that's my posting schedule, and therefore it's not my business what people do with it in terms of upvoting it or even commenting or following up. It's my job to make the post every day, that's what is up to me to do, and I trust everyone else and all of us to do our part. Therefore, it's nice and simple. I've got my posting strategy, I do my post every day, and then I don't have to obsess over how much income that one post makes because tomorrow I will be trying again with another post. The day after that I will be trying again with another post, and making a post every single day I'm guaranteed at some point to get a post that hits the trending page. I'm guaranteed at some point to get a post that gets a huge upvote. I'm guaranteed at some point to pick up a reader who loves reading every single day. Posting every day keeps things simple. One post a day, and then I'm done. 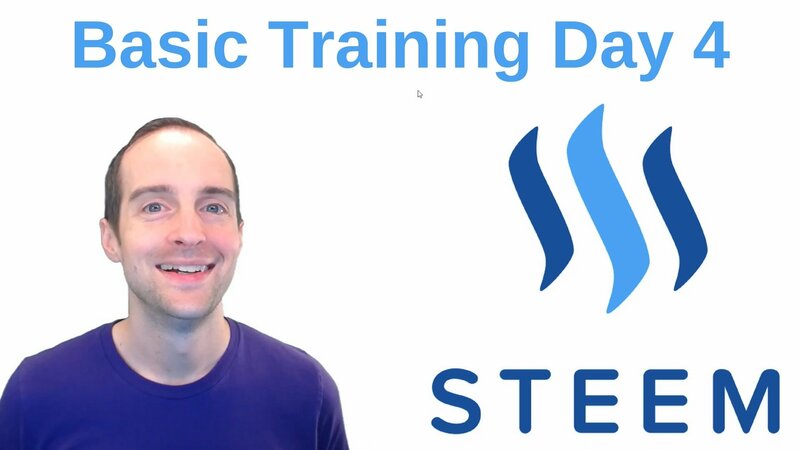 Thank you very much for enjoying day four of this 28-day Steem Bootcamp. I wish I would have set and stuck to a posting strategy early on. I said one post a day to start with and I did that for months, but then I deviated from it trying different posting links, and I have to say the one post a day is the big winner. You're awesome and I hope this was helpful. Thank you for reading this blog post, which was originally filmed as the video below. 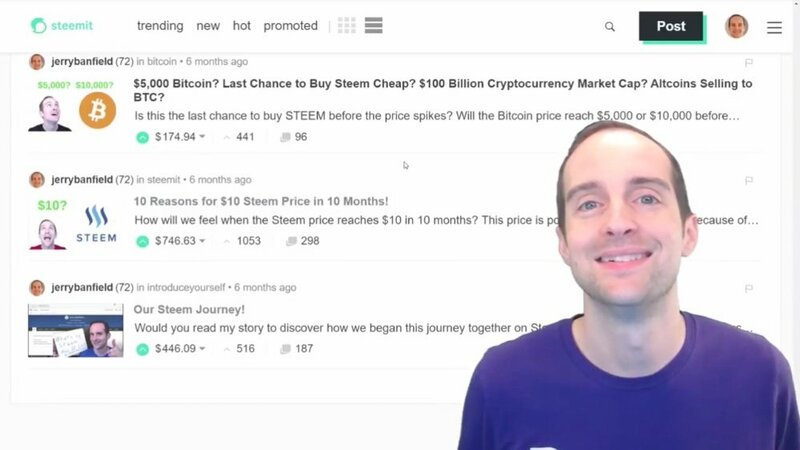 If you found this post helpful on Steem, would you please upvote it and follow me because you will then be able to see more posts like this in your home feed? Facebook page with 2,230,398 likes. YouTube channel with 216,596 subscribers. Would you please make a vote for jerrybanfield as a witness or set jerrybanfield as a proxy to handle all witness votes at https://steemit.com/~witnesses because 100% of my witness earnings pay for ads that will help promote Steem for years? Thank you to the 2200+ of us on Steem voting for me as a witness, the nearly 1 million dollars worth of Steem power assigned by followers trusting me to make all witness votes through setting me as proxy, and @followbtcnews for making these .gif images!